Many days throughout the year there are people gathered on the steps of City Hall calling on city government to make policy. On March 14, a rally of women and people of color who own businesses, organized by city Comptroller Scott Stringer, focused on a change that could significantly alter the direction of city government and opportunities for those business owners and others in similar positions. Those in attendance were backing Stringer’s push to have the 2019 New York City Charter Revision Commission put a proposal on the November ballot to require a Chief Diversity Officer in the mayor’s cabinet and one at each city agency. Fittingly, Mayor Bill de Blasio, AirPods in his ears, walked into City Hall at the time of the rally, seemingly paying it little mind. 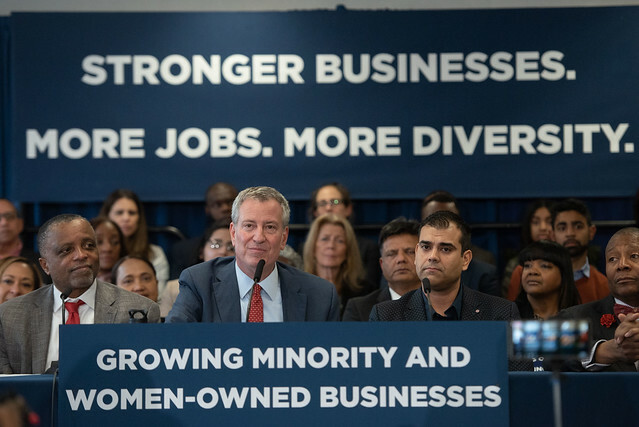 Over the last several years, Stringer has assailed the de Blasio administration’s approach to contracting with MWBEs -- minority- and women-owned business enterprises -- and called on the mayor to add a chief diversity officer (CDO) to his administration. De Blasio has adjusted the city’s MWBE contracting goals multiple times and created an MWBE office in 2016, but he has not created the CDO position. He has also repeatedly dismissed Stringer’s criticisms. A second-term Democrat who created a CDO at the comptroller’s office upon taking the citywide position in 2014, Stringer has now pushed the issue to the fore as the 2019 charter commission considers what changes to the city’s central governing document and structure it will propose to voters this fall -- it is listed first among Stringer’s 65 charter revision proposals. The City Hall rally, which included Stringer, MWBE owners, faith leaders, Manhattan City Council Member Ben Kallos, and Brooklyn Assembly Member Rodneyse Bichotte, came just hours before Stringer and others testified before the commission on the subject of adding the CDO positions to the charter. Among other responsibilities, the CDO position would oversee city procurement and contracting with MWBEs, as well as strategies to improve those efforts. The city spends billions of procurement dollars each year to buy things such as office supplies or hire contractors on city construction projects. The CDO would also focus on issues of equity and diversity in city government, with each CDO at individual city agencies handling these tasks with a narrower scope. The CDO in Stringer’s office, currently Wendy Garcia, is tasked with overseeing all of its procurement dollars, about $14 million spent annually. “Every time I see a law or a regulation or some rule that inhibits minorities or women to have access, my job is to fix it and change it,” Garcia told Gotham Gazette in an interview. According to Stringer’s charter revision proposals, Garcia has helped the Office of the Comptroller almost double its spending with MWBEs to over 24% of its procurement spending in fiscal year 2017. The Department of Design and Construction (DDC) has one of the biggest procurement budgets in city government, totaling nearly $1.7 billion, about as large as the other agencies with CDOs combined. DDC hired Chief Diversity and Industry Relations Officer Magalie D. Austin in 2014. According to budget testimony delivered last month by DDC Commissioner Lorraine Grillo, "Mayor de Blasio singled out DDC as the top performing agency in the City’s M/WBE program. We’ve awarded more than $1 billion to M/WBE firms since 2015. Between FY15 to FY18, our overall M/WBE utilization rate has increased from just under ten percent to 23 percent." Furthermore, the Metropolitan Transportation Authority (MTA) and New York State also have chief diversity officers. Governor Andrew Cuomo, who took office in 2011, responded to a 2010 disparity study by focusing on the state’s procurement dollars going to MWBEs. In 2014, he upgraded his goal for MWBE utilization from 20% to 30% of the value of state contracts. In fiscal year 2017, the percentage of MWBE utilization in New York State was 28.6%, according to Empire State Development’s Division of Minority and Women's Business Development Annual Report 2018. The state chief diversity officer originally solely oversaw the MWBE procurement process but has recently added workforce diversity and inclusion duties as well. Currently, the role of chief diversity officer is filled by Lourdes Zapata. Outside of New York City, the position of chief diversity officer can be found in other major city governments around the country, almost all only created in the past five years. There are currently chief diversity officers in Chicago, Boston, Philadelphia, Columbus, San Antonio, Austin, Nashville, and Buffalo. The duties (and titles) of these CDOs vary – most of the positions are human resources in nature, such as researching workplace diversity, recruiting diverse applicants for city jobs, and raising awareness for diverse hiring practices. If the proposal passed, New York would be the first major city with a chief diversity officer whose main job duty would be to oversee procurement for MWBEs. Atkinson’s office provides diversity training to city employees, publishes quarterly reports, and oversees the Office of Economic Opportunity, which manages procurement to WMBEs. Boston’s CDO Danielson Tavares has had more success reflecting the city’s population in the city’s workforce but does not oversee procurement. According to the first ever workforce report looking at diversity in Boston in 2015, just 42% of city workers were non-white while 54% of the city was non-white. The December 2018 report showed that out of the nearly 1,500 new city hires in the year before the report, 55% were non-white. Something both Atkinson and Tavares emphasized: for a CDO position to work, they need the support of the mayor of the city. It doesn’t seem like the proposal has it in New York. In a statement to Gotham Gazette, de Blasio spokesperson Raul Contreras highlighted the work of the Mayor’s Office of Minority and Women-owned Business Enterprises but was noncommittal regarding the CDO proposal that’s in front of the charter revision commission. “As long as it doesn’t get overly politicized, we see the power and leverage of a position like this necessarily maintained,” said Julie Nelson, Co-Director of the Government Alliance on Race and Equality (GARE). An issue the 2019 Charter Revision Commission brought up in its hearing was the already existing framework in the city overseeing M/WBE investment. Commissioner James Caras asked the panelist of experts who testified on the issue if a CDO was really necessary as the duties of the position, diversity hiring and overseeing the M/WBE program, are already handled by the Department of Citywide Administrative Services (DCAS) and the Mayor's Office of M/WBEs, respectively. Commissioner Stephen Fiala argued that the specifics of how a CDO would integrate with the current MWBE officers in city agencies are unknown and would only add to a complicated charter and city bureaucratic structure. A possible downside to the idea of chief diversity officers, said Nelson, is “when individual positions are allocated with the responsibility, that can take the pressure or the weight off other people” when promoting diversity. Asked about this reservation, Garcia told Gotham Gazette it is the reason the CDO must be in every agency and there must be one CDO who reports directly to the mayor. If skipped over by the charter revision commission, the creation of a citywide chief diversity officer could be legislated by the New York City Council, however the expert panelists at the revision commission’s hearing were dubious of this path as the charter is less malleable to political changes and pressures. When the 2019 Charter Revision Commission heard testimony on the proposal of creating a CDO at the March 14 hearing, commissioners appeared interested in the topic. After including the CDO concept in its list of issues to explore further, the commission heard from Stringer and others, among a series of expert hearings it held on a variety of topics, and will now put forward its narrowed focus areas on April 22. That list will determine which issues the commission plans to craft actual ballot proposals around for suggested changes to city government for voters to approve or disapprove in November. The MWBE program, created by city law in 2005, attempts to increase the amount of city procurement dollars that go to minority- and women-owned businesses. In fiscal year 2018, the city awarded $19.3 billion in contracts, of which $1 billion, or about 5.5%, went to MWBEs, according to Comptroller Stringer’s Making the Grade 2018 report. In 2007, it was just 1.6%. In the same 2018 report, Stringer gave the city as a whole a D+. Of the 32 mayoral agencies graded, only nine received a B or higher, including the Office of the Comptroller. On spending specifically with African-American-owned businesses, five mayoral agencies received a B or higher. To improve, Mayor de Blasio set the goal of awarding $16 billion to MWBEs by 2025 in his OneNYC plan, a goal which has since been increased to $20 billion by 2025. Amid earlier criticism from Stringer, de Blasio created the Office of MWBEs in September of 2016, which is currently responsible for overseeing the MWBE program. The office, currently led by Jonnel Doris, is part of the mayor’s office and is overseen by the Deputy Mayor for Strategic Policy Initiatives, currently Phil Thompson. The office was created and enhanced under Thompson’s predecessor, Richard Buery. Talk of a chief diversity officer actually came up in the 2013 New York City mayoral race. At a very early forum in the race -- held in June 2012 when Stringer was exploring a mayoral bid before he shifted to the comptroller’s race -- participating candidates including de Blasio criticized the Bloomberg administration approach to diverse hiring and MWBE contracting. According to news reports the candidates all supported the idea of a CDO at City Hall. “De Blasio also endorsed the idea, but said he would go further, making the person who holds that post a deputy mayor,” according to a Reuters article from the time. That’s what de Blasio has done, in a way. But the city has failed to hit MWBE procurement benchmarks that were codified by Local Law 1 in 2013. For example, 18% of the value of city construction contracts awarded are supposed to go to women-owned businesses. In 2018, the city awarded just 4.1%, according to the comptroller’s Making the Grade 2018 report. On the matter of diversity in the mayor's office and city government more broadly, little has changed since de Blasio took office, according to the most recent statistics available from the city. While de Blasio has elevated more women and people of color to top city leadership positions, the larger workforce is about what it was in Mayor Michael Bloomberg's final year of 2013. According to the U.S. Census Bureau, as of July 2017, New York City as a whole was 52.3% female and 46.7% male, and 32% white, 29% Hispanic, 24% black, 14% Asian, and 1% other races. According to the city's Department of Citywide Administration Services: in 2013 the mayor's office was: 60% female and 40% male, and 54% white, 17% black, 15% Hispanic, and 14% Asian; in 2017 the mayor's office was: 58% female and 42% male, and 46% white, 20% black, 15% Hispanic, 16% Asian, and 3% some other race. In 2013 the city government workforce was 58% female and 42% male, and 40% white, 31% black, 19% Hispanic, 8% Asian, and 2% some other race. In 2017 the city government workforce was 59% female and 41% male, and 38% white, 30% black, 20% Hispanic, 9% Asian, and 3% some other race. Nelson, of the Government Alliance on Race and Equality, told Gotham Gazette the vast resources and dollars of New York City could have a real benefit on policies that would help people of color, if implemented well. “What we don’t want to have happen is for these positions just to be spokespeople for the status quo,” she said. Note: this article has been corrected to reflect accurate procurement spending with MWBEs by DDC. The original published version of the article inaccruately described DDC as making minimal progress in MWBE contracting in recent years whereas it has increased such spending significantly. The City Council on Tuesday released its response to Mayor Bill de Blasio’s fiscal year 2020 preliminary budget, calling its own outline “a fiscally responsible plan that safeguards the city’s financial future and secures the city’s social safety net for New Yorkers.” Council Speaker Corey Johnson and Council members are calling for additional reserves and targeted investments, while also saying they’ve identified roughly $1 billion in savings that can be achieved between the end of the current fiscal year and the next one, which begins July 1. The Council spent most of March focused on the mayor’s $92.2 billion preliminary budget plan and the separate capital budget, holding over 30 hearings, at which leaders of 55 city agencies gave hundreds of hours of public testimony, according to the Council. The formal preliminary budget response is the culmination of this stage of the budget process -- and it comes just after the adoption of the new state budget, which significantly impacts how the city plans its spending. The Council will next move into negotiations with the mayor ahead of the release of his executive budget later this month, which will trigger another round of Council hearings, more negotiations, and a deal expected sometime in June. 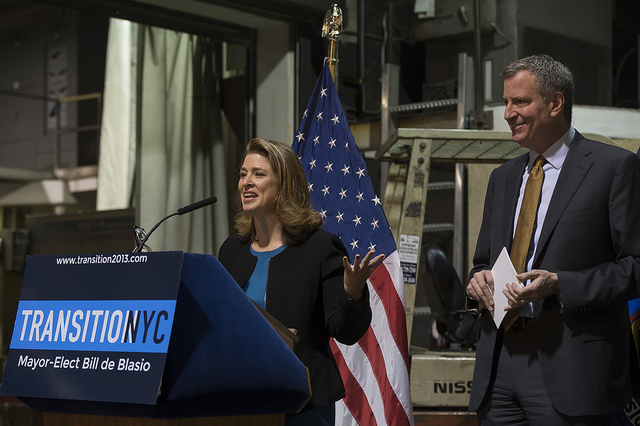 Appearing on Wednesday’s Max & Murphy show on WBAI radio, Johnson highlighted three areas of the response: growing the city’s reserves, strengthening the social safety net, and achieving pay parity for some sectors of the city workforce. First, the Council is requesting $250 million be added to the budget reserves, noting that the Council was able to secure $225 million during the last budget negotiations. Johnson said the city economy continues to look strong, but that a recession could be on the horizon. “We don’t entirely agree with the Office of Management and Budget” on revenue forecasts, he said, indicating that the mayoral administration’s budget office is being typically conservative in its estimates. Johnson said numbers over the next two months, as more tax receipts come in, will inform what will happen in the final budget. The city has billions in reserves but Johnson is worried that given the size of the city budget it may not be enough to weather a recession. Still, he did not indicate too much concern about the budget’s continued growth under de Blasio and the Council, with another $3 billion or so in spending expected for the coming fiscal year about the current one. The Council’s response also includes a request for pay parity for certain sectors of city workers, specifically human services providers, daycare workers, assistant district attorneys, and indigent defense attorneys. The request includes $109 for the indirect cost rates of human services providers and $89 million to increase daycare worker salaries. Additionally, the request includes $5 million to boost pay for assistant district attorneys and $15 million for indigent defense attorneys. Third, as he said multiple times throughout the preliminary budget hearings, Johnson reiterated on Max & Murphy that “we have to strengthen the social safety net in this city.” Within the Council’s budget response there are several proposals to increase funding for programs to help New Yorkers in need. Programs that the Council wants to better support include the New York Immigrant Family Unit, senior meals, childcare services at CUNY, Fair Futures for those leaving foster care, and social workers for families with children at each of the 57 Department of Homeless Services-contracted hotels. The Council is also requesting for $580 million more in education funding, which will go to fair student funding, an expansion of the Comprehensive After School System (COMPASS), security cameras in all schools, and renovations for school bathrooms. The response also calls for $40 million to fund the city’s efforts surrounding the 2020 Census, an expansion of pre-arraignment programming, a funding increase for the NYPD Collision Investigations Unit, expansion of evidence collections teams, the opening of a community justice center in Far Rockaway, and the prioritization of the Department of Homeless Services Peace Officers for crisis intervention training. The City Council wants to expand the pre-arraignment programming and calling for $2.2 million, increase the NYPD Collision Investigation Unit, and expand evidence collection teams with $1.2 million in funding, open a community justice center in Far Rockaway, and prioritize Department of Homeless Services Peace Officers for Crisis Intervention Training. In addition to Mayor de Blasio’s $750 million PEG (Program to Eliminate the Gap), which is set to find that amount of savings across city agencies in time for the executive budget, the Council is also recommending an additional $972 million in savings over two fiscal years. These savings come from agency efficiencies, additional revenues, and expense budget re-estimates, according to the Council’s budget response. The Council found several ways to make city agencies more fiscally efficient. It wants the current partial hiring freeze expanded to include 870 additional vacancies that it says should be frozen for fiscal year 2020 or eliminated altogether as planned spending. The Council also wants a $50 million cut to the planned spending on the ThriveNYC initiative, which is estimated at $250 million next year. ThriveNYC, First Lady Chirlane McCray’s signature initiative, has recently come under increased scrutiny for unclear benchmarks and a lack of transparency and accountability. The initiative was recently criticized by several Council members at a March 26 hearing and has been the subject of a great deal of press examination. The Council writes that a $200 million allocation for next fiscal year would better match the plan’s actual growth over the last few years as it has ramped up, consistently spending less than budgeted. Other efficiencies include reducing energy usage, uniform overtime, the city’s vehicle fleet, and the Entertainment Incentive Fund. The Council also wants to see better budget transparency and clearer accounting. “The Council asks the Administration to increase the number of units of appropriations and capital budget lines, create a comprehensive capital project tracking system, and establish a NYC Ferry Budget Report,” the Council’s response reads. Additionally, the Council believes that there are several revenue streams that the preliminary budget does not take into account, such as additional state and federal funding for the Department of Social Services. A planned expansion of the city’s school-zone speed camera program could also generate up to $30 million in additional revenue, the Council estimates. The Council also believes that the mayor’s budget estimates for various fines and fees should be revised upward, and also recommends re-estimates to the costs of various city obligations, such as interest costs on the city’s debt service and holiday pay at some agencies. On the capital side, the Council budget response calls for a “sizeable investment” to increase bus lanes, bike lanes, and pedestrian areas. These investments would be part of a master plan for New York City streets, which Johnson said he will introduce legislation requiring “in the next month or so.” That master plan is part of Johnson’s proposal for improving the city’s transportation and livability, as he laid out in his State of the City speech last month. “Transit is the lifeblood of New York City,” Johnson said on Max & Murphy. The Council’s response calls for installation of 50 miles of new bike lanes and 30 miles of new bus lanes per year. The Council is also requesting a doubling of the Department of Transportation’s Pedestrian Plaza program. After more than five years as New York City’s Deputy Mayor for Housing and Economic Development, Alicia Glen recently left City Hall, having spearheaded a major affordable housing plan, efforts to diversify the city economy, and other aspects of Mayor Bill de Blasio’s agenda, which she helped shape. Glen oversaw the city’s troubled public housing authority, the implementation of a new ferry system, investments into public land to spur business development and the rezoning of East Midtown, and more. In a recent lengthy and wide-ranging interview, she reflected on her work as deputy mayor, the state of the city as she leaves its government, some of the unfinished work she started, and the fact that for an official with her portfolio, much of the legacy will not come to fruition for years. Appearing on the What’s the [Data] Point? podcast from Citizens Budget Commission and Gotham Gazette, Glen also gave her take on the recently-opened Hudson Yards, what should be done with Rikers Island when the jails there are closed, the fallout from the undoing of the deal to bring Amazon to Queens, whether she might ever run for elected office herself, and more. Glen said that she came to the position with a different background from some of her predecessors in prior administrations, which fit the goals de Blasio had laid out as a candidate, to use the tools of government to fight inequality. “I am a woman and I think you do think about the world differently and how you structure deals. And clearly, I was a person in the administration who had come from more of a financial and pro-business background, but not to be conflated with somebody who had never actually been in the trenches working with all these issues, which I had been working on my whole life,” she said, explaining her perspective as she came into the job in 2014. “We clearly were elected as change agents with a mandate,” she said. Until de Blasio named Vicki Been, a former city housing commissioner in his administration, as Glen’s successor, Glen was the only deputy mayor for housing and economic development in this mayor’s tenure. 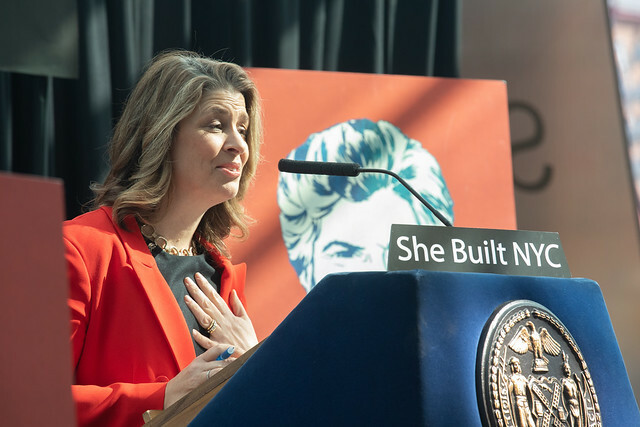 She helped design, redesign, and push ahead the administration's 300,000-unit affordable housing plan, which has coincided with changes to the city’s land use rules to help spur affordable housing and the upzonings of several neighborhoods. The plan has been criticized by some on the left as too broad, not targered enough on the lowest-income New Yorkers and those experiencing homelessness, with too many subsidized units for individuals of moderate and middle incomes. “Many many folks, many communities felt not included in that good part of the story and [Mayor Bill de Blasio] came in on a platform of ways we can address those issues, and so for me, obviously, thinking about how we could make a real dent and shift into a more proactive stance both on inclusive economic development for job growth and a more five borough economy and thinking about what that meant in the 21st century and then obviously his signature initiative of trying to do something in housing that was much bigger than been done, even in prior administrations,” Glen said. Now out of government, Glen was asked if the affordable housing mix was the right one. Unsurprisingly, she said yes, arguing it is important that New York not become a “barbell city” with only wealthy and poor people. She touted the administration’s work on the “messy middle,” helping to provide moderate- and middle-income people with subsidized housing. The de Blasio administration has been criticized for exclusively upzoning lower-income neighborhoods, communities of color, to both create more housing density and invest in local areas. Developers are thus allowed to build bigger, but have more affordable housing requirements in the mix. “I continue to think the mayor’s position and our position was that you have to link density to more equitable growth and you have to buy into the notion of growth,” Glen said. “We are now building a significant number of permanently affordable units across the city, both in private projects and neighborhood-wide rezoning. And that’s going to take a while to bake into the zeitgeist and for communities to realize that we meant it and that we have permanently changed the blueprint for how you do increased residential growth across the city,” she said. Asked which neighborhoods she would upzone if she could snap her fingers and do it -- a laughable concept given how notoriously contentious New York City land use decisions can be -- Glen returned to the list of neighborhood rezonings that the administration said it wanted to at least explore a few years ago, citing Flushing and Southern Boulevard in the Bronx as places she’d still like to see rezonings move ahead. The city has moved ahead on fewer than expected, though several major rezonings have happened, in places like East New York and East Harlem, with others on the docket for this year and beyond. The city’s public housing authority, NYCHA, has had a tumultuous past few years, from charges of mismanagement to illegality, with questions about mold and lead paint remediation, and forged documents, plus ongoing sagas around buildings that are falling apart. Recently, NYCHA and the city entered into an agreement with federal authorities at the Department of Housing and Urban Development (HUD), which includes a federal monitor of NYCHA. Glen expressed excitement about the “NYCHA 2.0” plan the administration announced at the end of last year, which includes a more aggressive program to build new housing on underused NYCHA land, housing that will be a mix of market-rate and affordable housing and the proceeds from the leases to developers will go into NYCHA repairs. On economic development, Glen also highlighted investments that she believes will pay off long-term for the city, including development of the Brooklyn Navy Yard and Brooklyn Army Terminal, key city assets that the city is now more fully utilizing to help spur job creation. She also cited the rezoning of East Midtown to foster modernization and growth of the key office and retail hub. Glen worked with City Council Member Daniel Garodnick to pass a complicated rezoning of the area that had faltered, she noted, during the end of the Bloomberg administration. Glen’s economic development legacy will also include her role in helping strike the deal, later undone, to bring an Amazon headquarters to New York City. “At the end of the day, they may not be as sophisticated as they should be and it’s too bad because ultimately having up to 40,000 jobs would have been a very good thing for New York City,” Glen said. However, she doesn’t see the failed Amazon deal disincentivizing other businesses from expanding into New York offices. “The fundamental reasons why Amazon wanted to be here are still here,” Glen said. “We still have the most extraordinarily diverse, educated talent pool and we have the coolest city.” She cited Google’s recent expansion in the city, which she said she helped negotiate over the course of years. Asked about the newly-opened Hudson Yards development of office, retail, and residential space on the far west side of Manhattan, Glen said, “It's not my personal favorite place. It's not a 'neighborhood' as they are characterizing it.” But, she also called it an “extraordinarily important piece of the broader New York City economic puzzle” because of the new office space coming online. “Architecturally and design-wise,” however, “it seems very male to me,” she said. The investments made have “proven to be true” and provide an important revenue stream. “I think that Rikers Island could be and should be a place where there are a lot of really important city services that can be relocated there, so that we can free up some of the other spaces that could be more highly utilized for housing, for schools, for job creation,” she said. She also said there could be “an interesting deal to be made possibly with the Port [Authority], to sell it to them to do the next [LaGuardia Airport] runway.” She indicated she has several ideas for land swaps with the Port Authority. Ben Max contributed to this story. For decades, school and district leaders across the country have struggled to answer a fundamental question: how to turn the tide for our nation’s lowest-achieving schools. Some have resorted to school closures, choosing to start anew and relocate those students to better-performing options. Others have tried to “turn around” underperforming schools, in the hopes that an influx of resources, a greater emphasis on data, and strong leadership could spur improvements in student achievement. 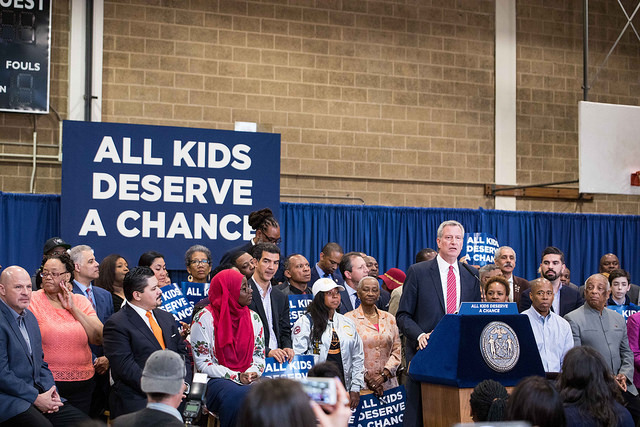 Mayor Bill de Blasio’s Renewal program, in particular, highlighted the promise of that alternative to school districts across the country. Rather than shutter 94 poorly performing schools across New York City, he provided a slew of targeted supports that included additional teacher training, new curricula, extra mental health counseling, and resources from community-based organizations. These additional services came with the conditions that schools set clear goals and remain accountable for sustained improvement. Over the course of four years, Renewal reflected a clear commitment to supports over school closures and a systems-wide approach; important ingredients of a successful turnaround effort. However, the initiative failed to incorporate input from practitioners and community members, creating a disconnect between policies and ideals—and the actual work of teaching and learning within their classrooms. Earlier this month, Mayor de Blasio had no choice but to end his $773 million school turnaround experiment, facing scrutiny over not only a lack of local engagement, but the nearly 75 percent of Renewal schools that failed to exhibit significant improvement over four years. In the wake of this latest setback, district leaders and policymakers across the country are still searching for the answer to this fundamental question. Atlanta Public Schools has shifted to a broader, system-wide effort to elevate all 89 schools in the district. Rhode Island continues to grapple with the ongoing struggles of its turnaround schools, even amid promising practices like common planning time for teachers, culturally responsive curricula, and concerted family engagement efforts. And Tennessee is experimenting with approaches that range from state-run school districts to innovation zones that offer extra resources and charter-like autonomy. School turnaround remains one of the greatest challenges in education today. Yet, in response to this challenge, we are not using tools and strategies that have actually proven to increase student achievement. Research that my colleague and I conducted last fall shows that only 11 percent of service providers supporting the work of school turnaround have demonstrated evidence of impact. While some providers may not have been evaluated yet, and others offer consultations or services that are more difficult to measure, the key take-away here is that states and districts are prioritizing partnerships with providers that have never demonstrated evidence their turnaround tools work. For an issue as intractable as school turnaround, shouldn’t we put our best strategies forward? First and foremost, we need to recognize that school turnaround begs a system-wide approach, a tenet that Renewal did take to heart. 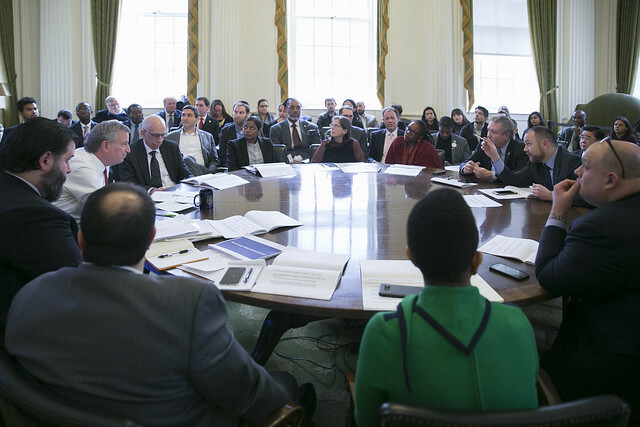 New York City Department of Education officials strove to leverage an ecosystem of partners to support students’ academic, psychological, social-emotional, and basic needs. Renewal’s successor, the Comprehensive School Support initiative, will offer a similar, system-wide approach, leveraging a data-driven system to surface the resources and supports that all students need. What is still missing from this picture is deep engagement of stakeholders across the school building and broader community. In a system-wide approach, district officials must work side-by-side with principals, educators, school support staff, health providers, out-of-school time providers, and community leaders to establish an overarching change vision for each school. They must investigate the traditional causes of decline and failure, ranging from significant teacher and leader turnover to chronic budget cuts and a lack of community engagement. And they must take on the role of offering the evidence-based, capacity-building tools and resources that this ecosystem of partners needs to successfully off-set those root causes. Most importantly, they must accept that effective school turnaround is a long-term effort, not to be achieved in just three years. Over time, we have worked with Gallup-McKinley County Schools in New Mexico, one of the largest and poorest districts in the state, which has recorded substantial, enduring increases in student proficiency. And in Ohio, a network of 20 turnaround schools demonstrated significant gains in student achievement. Undoubtedly, school turnaround will remain one of education’s most difficult challenges. However, we now know it can be done with an attention to system-wide stakeholder engagement, evidence-based tools, and the right supports from our school districts. 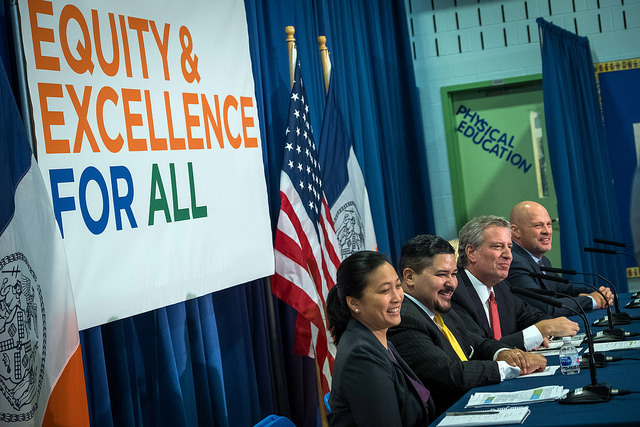 Mayor de Blasio and Chancellor Carranza should take note as they make their next attempt at turning around New York City’s struggling schools. Coby Meyers is associate professor at the University of Virginia School of Education and Human Development and Chief of Research for the UVA Darden/Curry Partnership for Leaders in Education, an initiative that has supported effective school turnaround efforts in New Mexico, Ohio, and districts across the country. The deadline for the state’s 2020 fiscal year budget is midnight on Sunday and state legislators are expected to work through the weekend as they negotiate a variety of thorny issues with Governor Andrew Cuomo, finalizing the details of policies that have been agreed to in principle, fighting over other issues that are less settled, and determining exactly how much to spend on what in the new fiscal year that begins Monday. Some of the budget bills are already public, with key details emerging, while the final of the series of bills, together commonly referred to as “the budget,” is likely to hold many of the major policy compromises that may come together in the final hours. Some high-profile deals already appear in place, including a ban on plastic bags (with some carve-outs) and an accompanying fee on paper bags. Ultimately, “the budget” will be a long list of compromises on spending, taxing, and policy priorities. The new budget is expected to come in at roughly $175 billion. The governor has been touting his top priorities -- congestion pricing, criminal justice reform, and a permanent property tax cap -- but there are a slew of other issues he cares about and those being pushed by the Senate and Assembly majorities, and even with Democratic control of both houses and the governor’s office, it’s hard to predict which ones will be included in the final budget bills. In the mix are also several cost shifts and funding cuts to New York City, which Mayor Bill de Blasio has warned about and is lobbying against. As has been the case over the years, it’s not likely that he’ll be successful in pushing back each and every one. The governor has made it clear that the Legislature must agree to his three top priorities, without which he says he won’t sign a budget before the deadline. He has been rallying to make the 2 percent cap on annual property tax increases permanent -- the cap is in place in counties outside New York City and will expire next year. He also says he fears that the Legislature will punt on criminal justice reforms -- changes to bail, speedy trial, and open discovery laws -- and believes the budget provides the right pressure to get to a deal, especially on the contentious and complicated details of bail. On congestion pricing, Cuomo has attempted to corral all the stakeholders, even winning the support of Mayor de Blasio, who had been a long-time opponent of the policy. Like with others, the details must be worked out and there are a variety of stakeholders who want a say. Long-term funding of the MTA is at stake, not to mention trying to reduce traffic in Manhattan. De Blasio warned in his own preliminary budget proposal in February that the governor’s budget would impose a $600 million burden on the city in cost shifts and cuts to existing programs. A large part of that total stems from $300 million in less-than-expected education funding, with the governor proposing a new school funding formula to reach the poorest schools in the neediest districts. The details of that formula remain a mystery. Education aid across the state is the largest portion of the budget and always one of the most contentious issues. 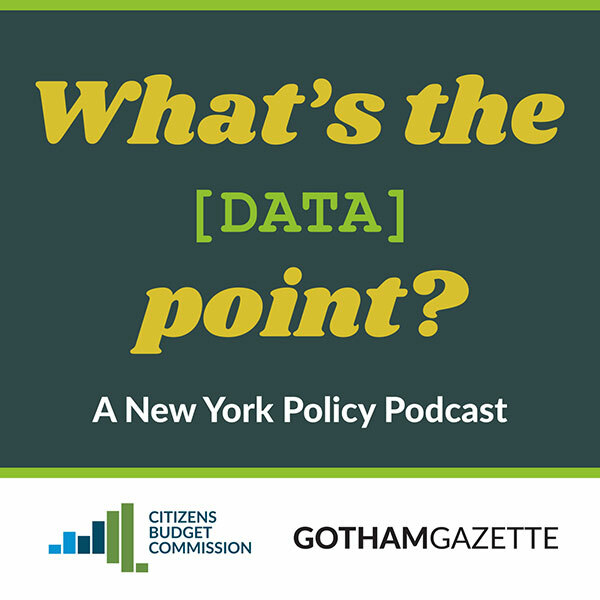 State legislators, advocates, and local officials always want a larger increase in aid than Cuomo believes is necessary, with data largely supporting the governor. This year, Cuomo is attempting to change the system, but it’s unclear whether legislators will go along, even with tweaks. The governor has called for public financing of elections, aiming to create a system similar to the one currently used in New York City where small dollar contributions are matched with public funds. Despite Democrats in both the state Senate and Assembly having supported legislation in the past to create such a system -- the Assembly has even voted it through its chamber -- there isn’t agreement on a final bill, and the possibility that it will either not make it into the budget or there will be a somewhat vague passage in the budget language that is a commitment to create a system at a later date, perhaps through a new commission. Assembly Speaker Carl Heastie recently raised several unfounded and some more legitimate concerns about the proposal and indicated that there weren’t enough votes in his chamber to approve it. But then his chamber had support for a public campaign finance system in its one-house budget resolution. Senate Majority Leader Andrea Stewart-Cousins and her members have been more steadfast in their commitment to campaign finance reform, with several senators loudly pushing for it along with a massive coalition of advocates representing more than 200 organizations across the state. Some long-sought campaign finance reform did pass earlier this year, with the significant narrowing of the infamous LLC loophole. Less talked about in the budget debate have been the governor’s proposals to tackle independent expenditures, which includes new disclosure requirements for 501(c)(3) and 501(c)(4) organizations, as well as Cuomo’s proposal to require any entity that spends at least $500 in a year to register as a lobbyist. Nonprofits, advocates, and activists have pushed back against the ideas, saying the governor is attempting to stifle his critics. Cuomo has also called for banning campaign contributions from corporations and limited liability companies, and a code of conduct for lobbyists, which Cuomo said he would implement for the executive branch if lawmakers do not approve it. The Legislature has already approved lowering LLC contributions to $5,000, in line with corporate donations. Advocates have also urged the passage of clean contracting bills that reduce conflicts of interest and prevent corruption in the state’s contract bidding processes. Cuomo has promised unilateral action on creating a so-called ‘database of deals’ which would detail projects receiving state benefits and make them accessible to the public. He’s also proposed strengthening the oversight powers of the comptroller and the state attorney general. It’s unclear if those provisions will also be passed into law. Republicans who controlled the state Senate for years were loathe to approve several voting reforms that Democrats repeatedly proposed in vain. This year, advocates were buoyed in their hopes that reforms would sail through. Some already have as the Legislature passed early voting and began the process of amending the state constitution to allow same-day voter registration and no-excuse absentee ballots by mail. The Senate has moved ahead on allowing the use of electronic poll books but there has yet to be a three-way agreement with the Assembly and governor’s office, though there have been rumors that a deal is imminent. There also isn’t consensus on how many days of early voting the state will allow or how much funding the budget will include to implement it locally. It's also unclear if a system of automatic voter registration may be implemented. 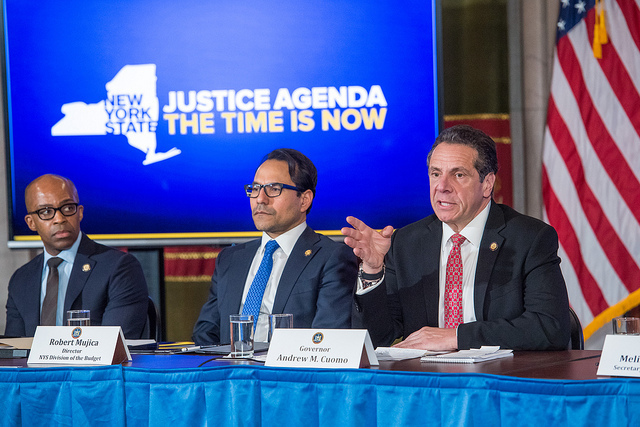 The three big reforms that advocates have long called for include banning cash bail and making other changes to pre-trial detention rules to keep far fewer people incarcerated, and implementing speedy trial and open discovery legislation. Cuomo has insisted the proposals must be in the budget and has even that he will “take the blame” for their passage if suburban legislators are worried about approving them. But there has been pushback against the proposals from the state district attorneys association, other law enforcement, and more conservative legislators. There has also been disagreement among progressive Democrats about where to draw certain lines, including around what discretion judges will have to determine the accused’s “dangerousness.” The Senate and Assembly nearly reached a deal a few weeks ago on the package of bills but it failed at the last minute. Given the focus on these issues, especially from the governor, a deal is likely. Transit issues have been front and center in this year’s budget negotiations with New York City’s subway crisis lending added urgency to the need to find a sustainable revenue source for the Metropolitan Transportation Authority (MTA). Cuomo has made a big push for congestion pricing as one of the main funding sources and has also called for restructuring the MTA board to give him more control, though he already appoints a plurality of board members and its top leadership, and the board rarely, if ever, goes against his wishes. Though the Legislature seems close to an agreement on a congestion pricing program, which would toll cars entering Manhattan’s Central Business District, the specifics haven’t been ironed out yet, including around exemptions to the fees, changes in bridge tolls, and investments in other MTA branches, like LIRR and Metro North. Cuomo has also called for the state and New York City to split 50-50 any MTA capital costs that aren't covered by dedicated funding streams. It's unclear if state legislators will allow that language to be part of a final budget deal or if the process around negotiating the MTA capital budget will be left to a later date as it typically is. Speaker Heastie indicated the Assembly is willing to advance the proposal in principle while Senate Majority Leader Andrea Stewart-Cousins has been less definitive. The governor’s proposals for the MTA’s structure also remain uncertain. The governor has also proposed allowing municipalities to legalize the use of electronic scooters and bicycles, and big firms that offer those services have been expending significant resources lobbying state lawmakers, regulators and the governor’s office to push that policy through. Legalization would be particularly impactful in New York City, where the NYPD and Mayor de Blasio are facing criticism from the City Council and advocates over a crackdown on e-bike use that has been particularly impactful on immigrant delivery workers. Cuomo has proposed legalizing the recreational use of marijuana for adults, which the state estimates would raise about $300 million in revenue annually. He had hoped to use that revenue to fill the MTA’s budget gaps. But earlier this month, Cuomo raised doubts about whether marijuana legalization would be included in the state budget and said if it was not, then it most likely would not happen at all this year. However, the Assembly and Senate leaders have indicated that they are willing to advance it. As the budget negotiations moved ahead, it appeared a marijuana legalization deal would not come together in the budget, but nothing at all in play is ever fully in or out until the budget is done. The New York Counts 2020 coalition of nonprofit organizations, business groups, and community service providers have been pushing the state to include at least $40 million in the budget to fund outreach efforts for the decennial population count next year. This census, where New York has a great deal on the line in terms of congressional representation and federal funds, will be particularly challenging, with the federal government underfunding the Census Bureau and primarily relying on a digital methodology, which is a departure from previous years, not to mention the push for a citizenship question. New York already faces its own unique issues with reaching hard-to-count communities, particularly because of the state’s large immigrant population, much of which is concentrated in New York City. And though the state created a commission to examine the issues around the Census, it was not named until after its initial deadline for submitting a report had already lapsed. That report is not expected until after the budget. Indications on Thursday, including from the city’s Census leader, Julie Menin, pointed to the $40 million being included in the state budget, but that had not been finalized. In past years, Governor Cuomo and Senate Republicans repeatedly dangled mayoral control of New York City schools over Mayor de Blasio to extract concessions such as increasing funding for charter schools and more transparency from the Department of Education. This year was less contentious but Democratic legislators still wanted adjustments to approve an extension. The mayor is expected to receive a three-year extension on mayoral control, up from a two-year renewal last time and multiple single years before that, but will nonetheless have to commit to certain demands made by legislators from his own party, including improvements in parent engagement. New York City this year reached a statutory cap on the number of charter schools in the five boroughs, which Cuomo and Republicans had increased in previous legislative sessions. Charter school advocates have continued to push for eliminating or increasing the cap but lack powerful allies in the Legislature. If there is an increase in the charter cap snuck into the budget, it will all but certainly be because Cuomo made it a priority. Cuomo proposed an increase of several hundred million dollars in education funding, for a total of $27.7 billion, and spoke of a new “Education Equity” formula to replace the Foundation Aid formula currently used to provide additional funding to school districts. But he hasn’t released details of the proposal, which the state education department is meant to outline. That has incensed education advocates and New York City elected officials who say the governor is not living up to the Campaign for Fiscal Equity court decision which would means billions more in education funding. The two legislative majorities outlined increases in education aid of more than $1 billion in total, with the final number likely somewhere between theirs and Cuomo's. Besides congestion pricing, budget negotiations have also involved other possible revenue raising measures including a pied-a-terre tax, a real estate transfer tax, an internet sales tax, and the extension of the state’s so-called millionaires tax. After talks of marijuana legalization seemed to stall, the Senate had floated the idea of a pied-a-terre tax on people’s second homes worth more than $5 million in New York City to replace the revenue that would have come in for the MTA from marijuana taxes. The pied-a-terre tax could raise an estimated $650 million each year. Cuomo was on board with the proposal as well, but the Assembly shot down the idea, citing difficulties in navigating the complicated property tax system in the city. Speaker Heastie said instead that the state should do a simpler one-time tax on expensive real estate transfers above $5 million. The discussion appeared to stall. Cuomo has additionally proposed eliminating a loophole that allows third-party online retailers to avoid collecting sales taxes -- which could bring in nearly $400 million in revenue. On the millionaires tax, there reportedly seems to be three-way agreement on a five-year extension of the current rates, though an Assembly proposal to increase the tax, and the number of people it applies to, did not get much support. A previously-scheduled middle class tax cut appears to be staying as designed. Cuomo had proposed as much as $550 million in additional state Medicaid funding in his budget proposal but he pulled back in February as the prospect of federal cuts to healthcare loomed and tax revenues came in lower than expected. Both the Assembly and Senate pushed to restore that funding and Cuomo appeared to backtrack. After he and the Legislature overrode a New York City law to impose a fee on single-use plastic and paper bags at retail stores two years ago, Cuomo introduced legislation last year to pursue a statewide plastic bag ban. The bill failed in the Republican-led state Senate but Cuomo reintroduced the proposal this year and it appears on the verge of passage, with a variety of carve-outs and other specifications, like a fee on paper bags and opt-out provisions for localities. Legislative leaders indicated on Wednesday that they had reached an agreement on the bill and that it will likely be passed with the budget. There’s also a concerted effort this year by environmental advocates to advance the Climate and Community Protection Act, which would transition the entire state economy to renewable sources of energy by 2050. The bill has passed in the Assembly three years in a row but there isn’t consensus this year with the governor’s office or the Senate. Cuomo introduced his own Climate Leadership Act, which is similar in ways to the CCPA but would only mandate that the state’s electricity sector be renewable by 2040. Advocates say his proposal doesn’t go far enough and it’s hard to see what compromise he may reach with the Legislature. This legislation has been little discussed by Cuomo or legislative leaders as the budget deadline approaches. If the state Legislature fails to pass an on-time budget, which would technically mean by the April 1 deadline, senators and Assembly members will lose out on a $10,000 annual raise (from $110,000 to $120,000) in their base pay which is meant to go into effect on January 1, 2020. The raises were put into motion by a state commission last year, which set a schedule to bump up legislator salaries over a three-year period. The raises also apply to the comptroller, state attorney general and certain state agency commissioners. Cuomo has seemed to use the raises as leverage over the Legislature to ensure that the budget is not late and that it includes his priorities. In June of 2018, Mayor Bill de Blasio rolled out a plan to eliminate the Specialized High School Admissions Test (SHSAT) for New York City’s specialized public high schools, in an effort to increase diversity, especially for black and Latino youth, at the city’s eight elite test-based institutions. Joined for a press conference in Brooklyn’s JHS 292 school by a Hunter College student, Schools Chancellor Richard Carranza, and a number of City Council members and State Assembly members, he hosted a rally-like announcement, where he initiated a call-and-response: “Time for change?” de Blasio asked three times. “Yes!” the audience yelled back. But it’s not simple. He received swift backlash from the city’s Asian-American community––especially those of low income, who comprise a significant portion of the specialized public high school student body. Though his plan was celebrated by some local politicians, as months passed, some began to shy away from their support for de Blasio’s plan and insisted on a more broadly palatable path. De Blasio had not gotten much of the necessary buy-in to move his plan in the state Legislature -- state law dictates that the SHSAT is the sole criteria for entry into the three largest specialized high schools, Stuyvesant, Bronx Science, and Brooklyn Tech -- the mayor did little else to push his plan, and the discussion fizzled. Then came the news earlier this month that of the 895 students offered admission to Stuyvesant High School, the city’s most rigorous and exclusive public school, only seven of those students were black. The controversy reenergized the debate around school admissions, the SHSAT, the city’s larger school system, and other key issues, embroiling not only city politicians, but also those who work in Albany. The latest data for admissions to Stuyvesant and the other specialized schools set off a new round of questioning the use of the SHSAT (few if any other learning institutions at any level across the country use a single test to determine admissions) and reinvigorated interest in plans put forth by de Blasio and others to ensure more racial and ethnic diversity at the schools. While those who prefer the current system dug in. Governor Andrew Cuomo agreed the lack of diversity at the schools is a problem and said the city should change admissions at the five schools it controls and then put pressure on state legislators to follow suit for the other three. He did not offer any specifics on what he believes to be the right admissions criteria. Neither Assembly Speaker Carl Heastie nor Senate Majority Leader Andrea Stewart-Cousins has taken a concrete position on the SHSAT and specialized high school admissions. Heastie did say on March 8 that he wants to see “more specialized slots” and the schools "more reflective of the city's population," but he did not go further. He said the Assembly majority would take the issue up at some point. A group of state senators called for “open dialogue and consensus-building on school diversity and admissions.” Queens Senator John Liu, who chairs the Senate’s New York City schools subcommittee, said de Blasio’s plan exacerbates racial tension, but brought together colleagues to announce a plan to hold hearings later this year. “What we need is open-mindedness and open dialogue in order to build a consensus for a plan going forward,” Liu said. Other senators echoed Liu, decrying the city’s diversity statistics and calling for a series of community forums, but neglecting to offer any other concrete solutions. De Blasio said he looked forward to future dialogue. A couple of weeks later, on Thursday, he acknowledged that he did not roll out his plan well, and pledged more engagement with the city’s Asian communities. Johnson also wrote that City Council will soon consider new legislation addressing diversity in specialized high schools and beyond, including a task force to determine new admissions criteria, codification of the School Diversity Advisory Group, establishing District Diversity Working Groups in each school district, and the creation of an oversight role housed in the city Human Rights Commission called a School Diversity Monitor. "The problem with the specialized high schools’ admissions process runs much deeper than one test," said Council Member Mark Treyger, chair of the education committee, in a statement, noting that he will hold a hearing on school segregation next month. Treyger also cited an op-ed published in the New York Daily News on Wednesday by Public Advocate Jumaane Williams, who argued against eliminating the test and pushed for expanding gifted-and-talented programs citywide. "I won’t support a plan that solely abolishes an exam, which was essentially the Mayor’s plan," Treyger said. "I’m open to a plan that includes revamping and expanding enrichment programs, adding more crucial seats, across all districts, particularly in communities of color. We must engage with all marginalized communities as we examine how to better integrate schools, from pre-k to high school. We need full integration, which means examining evidence-based multiple measures to enter specialized schools, and the pipeline of schools that populate them and the rest of our school system." Brooklyn Borough President Eric Adams initially backed de Blasio’s plan to eliminate the use of the SHSAT and move to multiple measures for admissions to the specialized schools, even appearing at the announcement to lend his support, but he then backtracked. Adams penned an op-ed in the Amsterdam News last July voicing his support for the SHSAT––with caveats. He called for “free preparatory services for every student who wants to take the SHSAT but faces economic hardship,” funded by the city, in addition to expanding middle school gifted and talented programs. Additionally, he advocated creating five new specialized high schools, one per borough, and incorporating other academic metrics like class performance into the admissions process. This week, Adams’ office told the Gotham Gazette that his position remains the same. After de Blasio announced his plan, Bronx Borough President Ruben Diaz, Jr. also voiced his support, calling it a “welcome step forward” and a “validation of the diligent work of so many elected officials, educators, activists and parents whose efforts have focused on this issue for years, if not decades.” Like Adams, he has since walked back his support, telling the Max & Murphy podcast this week that he favors a more holistic admissions approach that includes the SHSAT in addition to a number of other academic criteria. Asked for her position by Gotham Gazette, Manhattan Borough President Gale Brewer advocated for methods of improving diversity beyond eliminating the entrance exam and also called for community forums. 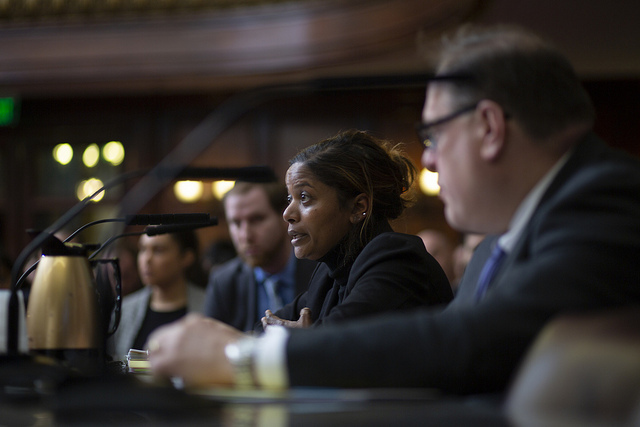 The city should engage in “a back and forth with students and parents about the many options to reform the admissions at these specific high schools,” she said. City Comptroller Scott Stringer has not responded to a request for comment. Note - This article has been updated with comment from Council Member Mark Treyger, who chairs the Committee on Education. Alicia Glen was Deputy Mayor for Housing and Economic Development under Mayor Bill de Blasio for more than five years, until she recently left the administration after being the chief architect of its signature affordable housing plan, a broad variety of economic development initiatives, and more. Glen joined the podcast (for the second time) for an "exit interview" on her legacy as deputy mayor, key issues facing the city and where the city is headed, the city's overall economic competitiveness, the Amazon deal that was undone, NYCHA, whether she would ever run for elected office herself, and other topics. In 2017, Mayor Bill de Blasio unveiled a plan to create 100,000 “good-paying” jobs, with annual salaries of $50,000 or more, within 10 years, giving New Yorkers a pathway to the middle class. On Monday, City Council members held an oversight hearing on that plan, attempting to more fully gauge how the de Blasio administration is doing on its promise. Bronx Council Member Ritchie Torres, chair of the Council’s Committee on Oversight and Investigation, co-led a tense Council hearing where the head of New York City’s Economic Development Corporation (EDC), James Patchett, was grilled about how many jobs had been created as part of de Blasio’s jobs plan and who has been getting them. Patchett responded to Torres’s rapid-fire questioning about unclear jobs numbers with a consistent message: answering a simple question like “how many jobs have been created” is not so easy. De Blasio declared good-paying jobs to be those that pay $50,000 or more, and said those in his plan would be in economic sectors that will be around for years to come. 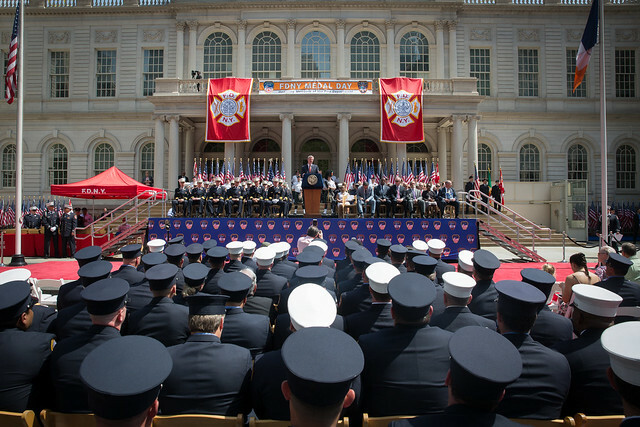 When de Blasio, Patchett, and then-Deputy Mayor Alicia Glen laid out the plan a few months after de Blasio announced the goal during his 2017 State of the City speech, they said that they would only count jobs spurred by some kind of city action. The plan focuses on investing in city-owned property, providing tax incentives to small and large businesses, making infrastructure investments, using zoning tools, and directly investing in companies that can bring 21st century jobs to New York City. About $1.3 billion in capital funding has been allocated to New York Works, with about $300 million already spent, Patchett said, on projects like the Steiner Studios at the Brooklyn Navy Yard and the FutureWorks advanced manufacturing shop at Brooklyn Army Terminal. But even with specific strategies and budget numbers, there still remains a fair amount of estimation in gauging the impact of the plan. “Of the 19,000, how many are actually working today?” asked Torres. “We make projections based on the best available data,” said Patchett, explaining that in some scenarios, when EDC completes a project under the New York Works plan, actual jobs are still yet to come. The economic development agency tries its best to project how many jobs will be created based on the expertise of their in-house economists, detailed economic data, and, in some cases, specific contracts that have been signed. A recent example can be found in the Staten Island Teleport Campus. In 2018, EDC reported in the New York Works progress report that it had “closed a deal” to create office space on the Staten Island campus meant for medical tenants, a charter school, adult education programs, and a variety of social ventures. Though no businesses had formally moved in, the agency estimated 750 jobs would be created and counted that towards de Blasio’s goal. In the same report, EDC also noted the city “opened 500,000 square feet of space” at the Brooklyn Army Terminal, creating 1,000 good-paying jobs towards the mayor’s 100,000 jobs goal. It is unclear whether these jobs have actually been created or are still a projection, according documents published by the Council. 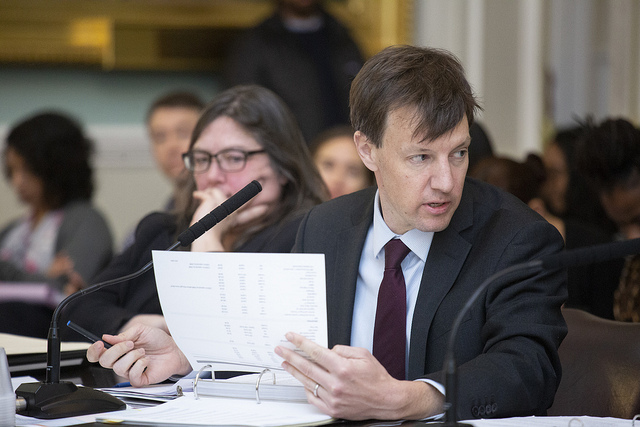 Patchett also confirmed that if out-of-state residents were to get a good-paying job created under de Blasio’s jobs plan, it would count towards the mayor’s goal. When de Blasio announced the New York Works jobs plan in June 2017, he said the good-paying jobs would be meant primarily for New Yorkers who wouldn’t necessarily otherwise have access to such opportunities. But for City Council members that represent the city’s lowest-income residents, there are persistent concerns whether these good-paying jobs end up accessible to people in their districts. Brooklyn Democrat Inez Barron, who represents the 42nd Council District where more than 30% of residents are under the poverty line according to census data, wanted to know why most of the $1.3 billion allocated to New York Works is for building and development projects rather than programs that could help train residents to actually qualify for the good-paying jobs de Blasio’s plan sets out to create. Patchett mentioned that workforce development strategy is outside the purview of EDC, but he reassured the Council member that the agency works closely with higher education institutions such as LaGuardia Community College and other CUNY schools, along with the New York City Department of Education to inform them of what they think the skills of the future are that educational institutions should be aware of when creating training programs. Monday’s hearing was also co-led by Queens Council Member Paul Vallone, chair of the Council’s Committee on Economic Development. Vallone left the hearing unimpressed. Near the end of the hearing, tensions between Torres and Patchett simmered down a bit, with Patchett offering a solution to Torres’ contention around confusing jobs numbers.